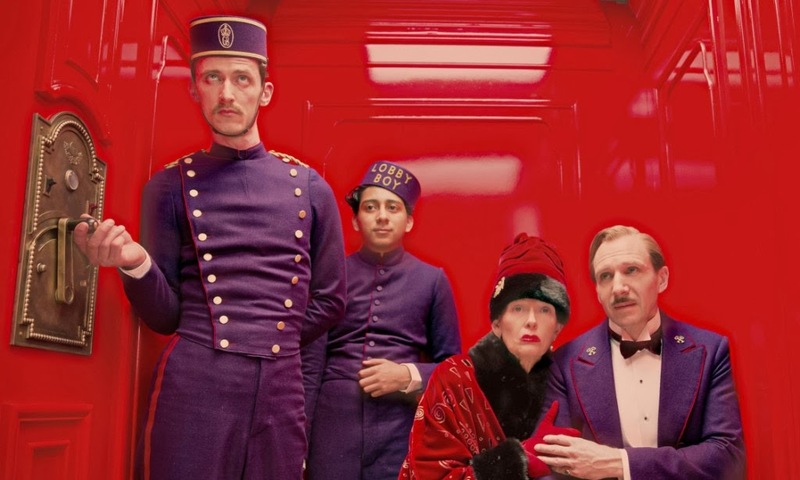 Eye popping colours and a story that moves at relentless pace, filled with great comic timing and sharp editing, all combine to present Wes Anderson's latest filmic offering The Grand Budapest Hotel (TGBH). The whole film nestles things within things - ideas within ideas, stories within stories, cakes within boxes. In fact, there was so much stuff crammed into its 99 minutes that I felt exhausted at the end of it! I felt I needed a rest. The narrative is driven by Ralph Fiennes who stars as Monsieur Gustave, the Concierge of TGBH which is located in an anonymous Eastern European country. Fiennes' comic timing, facial expressions and the physicality he brings to his character offer a link directly back to the classy style of Harold Lloyd and Buster Keaton et al. There is hardly a scene in the film where he is not present. His character is beguiling and at the same time frustrating as he seems to be able to engender in everyone the feelings of greatest warmth and respect towards him. The whole film is as I have said a nestled story but it nestles four times! It goes back from today to 1932 and recounts how the ownership of TGBH passed from Madame D (Tilda Swinton) to Monsieur Gustave and ultimately to Zero Mustafa (Tony Revolori). There is murder and war, families falling out, imprisonment, secretive monks in cable cars, trains - oh, and did I mention cakes? There is also a constant sexuality embodied by the curious and bi Monsieur Gustave who boasts he's had older than the 83 year-old Madame D! Yes this film is very funny and it tells its story very cleverly. The conception and visualisation are very creative and the Direction spot on. The acting from a massive top-notch ensemble cast is brilliant and the comedy keeps delivering. But I'm still getting my breath back. Is that a bad thing? For all it's strong points - and it has many - I couldn't help feeling it left me feeling just a little disappointed. Perhaps Wes Anderson isn't my kind of film maker. Perhaps I'm not his kind of viewer. If you want to see something odd-ball and very funny but relentless in its pace - give it a go. I'll give it a 7/10.